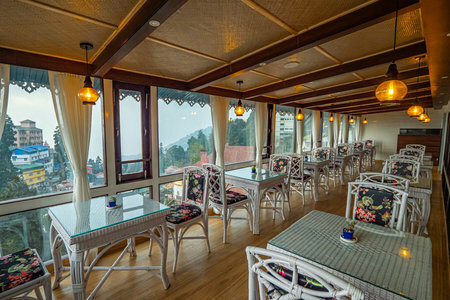 This is one of the several Summit group of hotels in Darjeeling. However unlike the others, this one is located right at the busy and noisy center of the town. The Chowrasta Mall is only 5-minute walk from the hotel. It's a four storey building which you are likely to miss in that jungle of shops, hotels and other commercial establishments, but once inside it's quite charming. From the ground floor (i.e. the road level), you need to walk up to the first floor where the reception is. You can ask the guard at the ground floor to help with your luggage, he will call any waiter if required. The reception area is simple and has a lobby with few sofas laid out, and a wall TV. During non-busy hours this is where most staff gather to watch the TV and spend their time. There are 25 rooms in the hotel and most rooms are above the reception level. Always ask for a room at one of the upper floors to get better views. But only limited valley facing rooms have good views of the mountains and the valley and very few have full view of Kanchenjunga peaks. So if view is what you are looking for, then try to get rooms in the top floor at the valley facing side and at the corner. 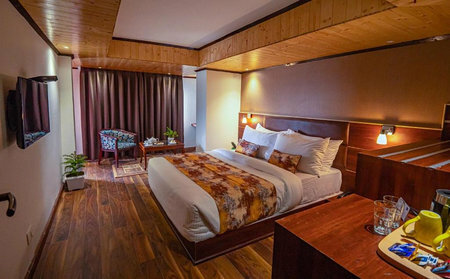 There are essentially two types of rooms - Premium rooms are meant for couples while the family rooms have an extra bed and are also quite spacious. Noise could be a big issue for rooms facing the road and sleeping at nights can be difficult for many. Note that some rooms (particularly 104 and 106) are quite small with hardly any space to move around or keep your luggage. However some premium rooms like 301 are quite spacious and have nice mountain views. All rooms have attached western style toilets with 24-hours hot & cold shower. In-room amenities include tea/coffee maker, LCD TV with cable channels, complimentary room heaters in winter, complimentary bottled water, newspaper etc. The bathrooms have hairdryers, rain showers, slippers, towels etc. Rooms and the lobby area also have free wifi, but not sure if all would be satisfied with speed and consistency. There is no elevator in the hotel. If you get a room on the 4th (top) floor, you will need to climb some 110 steps. So if you have problem walking, this hotel is certainly not for you. The multi-cuisine restaurant is large and the food has been consistently good. Try out the Chinese items, they usually make it well. But watch out for the price and the taxes. Other than Chinese, the restaurant also serves Indian and Continental food. However the standard breakfast which is packaged with their room rates is unsatisfactory. Most days you will likely find only the same stereotype South Indian food. There is also a spa in the hotel as evident from its name. You can get various kinds of massage and skin treatments here. The spa is also open to outsiders. 1) Like rest of the summit group of hotels, this one too relies mostly on travelers looking for good deals through online or other travel agencies. Very few would otherwise know this hotel by name and that actually sums up for its overall reputation. Having said that, it's a nice hotel with standard amenities in its class and the main advantage of the hotel is its central location. 2) The service in the hotel is quite unprofessional at times. This is likely because of lack of training to the staff. The waiters try to be friendly, but run out of their steam when the hotel gets full and pressure mounts on them. Sometimes such unacceptable level of service is visible even at the reception as you notice their nonchalant behavior. I hope this improves with time. 3) Although the hotel claims 24-hour room service, sometimes you can have hard times getting what you want. This is particularly so in high season. 4) Some rooms are so small and noisy (due to adjacent road) that value for money becomes almost zero. So watch out for such rooms. Otherwise, it could be a decent stay here. The hotel is located only a minute's walk from the Gandhi Road and Laden-La road junction where the main taxi stand is (i.e. Club Side taxi stand).